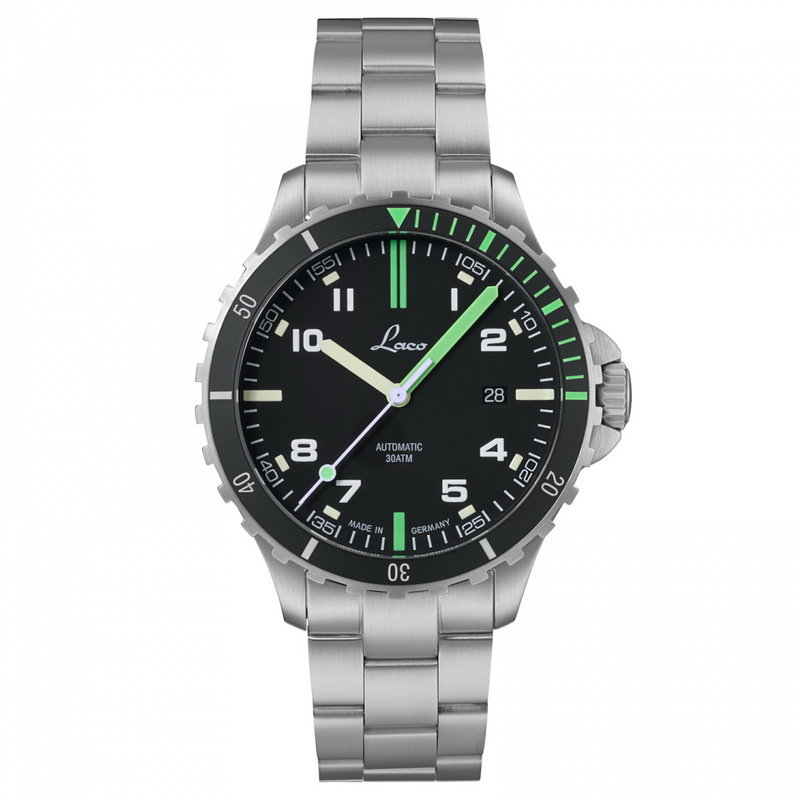 LACO have a brand new collection of Squad Watches inspired by the some of the World’s most dramatic adventure destinations. Explore the Amazon Rain Forest with the Laco Squad Amazonas with its vivid green; dive-time scale, minute hand, lollipop seconds indicator and 6 and 12hr markers. The Amazonas has a 42mm in diameter by 13.5mm thick Stainless steel case which is fitted with a double domed and anti-reflective Sapphire crystal and a screw-down case-back with scorpion relief. 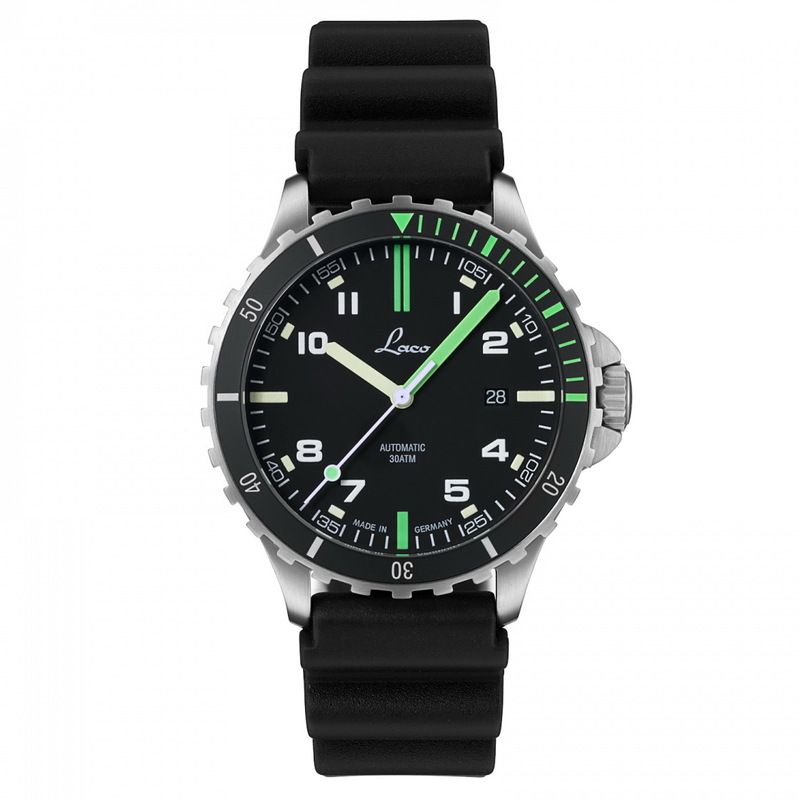 Further diver’s features include: a guarded screw-down crown, a unidirectional rotational diver’s bezel with a ceramic inlay ceramic with luminous dive-time scale and 300m of water-resistance. The Amazonas gets a matte black dial with combination baton and Arabic numerals brightly glowing SLN, a white minute track and a stealthy black date window at 3 o’clock. Power comes from a 17 jewel automatic movement, the Laco 24 which is based on an ETA 2824.2 Elaboré grade. Irrespective of which of the four new Squad Watches you choose, all sport a special case-back with a 3D scorpion motif. I am not sure of the significance of the scorpion but it does look cool! The Amazonas comes with a 22mm black rubber divers strap or alternatively opt for the Amazonas MB and get a 3-link Stainless steel bracelet with a diver’s safety clasp. MSRP is 930€ (rubber) / 990€ (steel), so just another 50 euros for the bracelet which is very fair. Thoughts? My least favorite of the new collection but fans of green will find it irresistible, I'm sure.